Next up is a book that helps me cross off a book for the 2010 Chick Lit Challenge. Dean delivers another pop artifact in her latest riff on the Gossip Girl generation, this time dressing up the goings-on with a very Devil Wears Prada vibe. Landing a job as second assistant to Iris Whitaker, a Metronome Studios hotshot, sounds like a dream come true for Ohio native Taylor Henning, who naturally wants to make it big in Hollywood. But this fish out of water needs to learn quickly how to swim with the sharks, as Iris’s first assistant, Kylie Arthur, would prefer she drowns. Thankfully, a fairy godmother appears in the fierce form of Quinn, Iris’s 16-year-old daughter, who suggests Taylor follow her surefire high school rules: fake it till you make it; speak up in class; make one cool friend; and realize lunch is a battleground. But there are unforeseen consequences for Taylor, who remembers some age-old advice just in time. It’s a slick little novel: catty, glitzy and just mean enough. I discovered Zoey Dean while browsing the book section at Target. I noticed her A-list series in the store and purchased the first story. Over the next few years, I read many of the books in the series. I was excited to find out that Dean had published a non-YA novel, How to Teach Filthy Rich Girls, which I read and enjoyed. I kept purchasing new works by Dean because I found each new story entertaining and original. The plot of each book was unexpected and enjoyable. 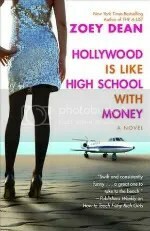 As a result, I was excited to see that Dean had published a second novel, Hollywood Is like High School with Money. I expected the same great story telling in this latest release, however I was largely disappointed. The main problem with this story was that I felt as if I had read it before. The story line was largely predictable with its “20-something relocating from Middle America to a big city” tale. Taylor, the main character, hits a rough time at first, but starts to be able to maneuver the difficult world of working with celebrities. With the help of a surprising ally, she falls into the classic pitfall of becoming overconfident, which leads to her hitting a road block. In the end her ability to stick with it leads to a happy ending. There was one plot-line in the story that I did find original. This was the fact that Taylor’s ally was her boss’s 16-year-old daughter Quinn. While this had the opportunity to make the story more creative, it just ended up not being believable. The fact that such an integral part of the story didn’t feel real dampened my enjoyment of the story. Review: The combination of predictable plot and forgettable characters led to a book that was just OK. This book would be a good vacation or beach read: entertaining but not really memorable.